Pieces assembled by an aviation pioneer find a home at the ANA Money Museum. 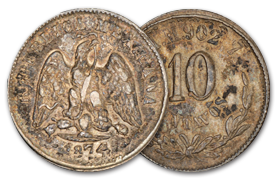 The ANA’s Edward C. Rochette Money Museum has been the beneficiary of many thoughtful donations of collections assembled by people of different backgrounds. 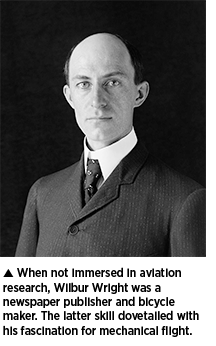 A gift of particular interest is the one put together by famous aviator and inventor Wilbur Wright (1867-1912). This well-balanced collection includes many interesting pieces from around the world, and provides a glimpse into Wright’s fascinating life and travels. The accomplishments of Wilbur and his brother Orville (1871-1948) are well known. In 1903 near Kitty Hawk, North Carolina, they conducted the first powered flight of a heavier-than-air craft. Initially, the brothers received neither fame nor financial gain, but they continued to improve upon their invention. In 1905 they produced the first functioning fixed-wing aircraft. Eventually, Wilbur and Orville earned international acclaim, and since then they have been honored on a number of coins and medals. They are the subject of state quarters representing North Carolina and Ohio, and a 2003 series of U.S. commemorative coins. Wilbur died in 1912 of typhoid fever at the age of 45. Neither he nor Orville married or had children, but they had several nieces and nephews. Their oldest brother, Reuchlin, had a son, Herbert, who in turn had a son, whom he named Wilbur H. Wright after his celebrated uncle. Wilbur H. Wright (1920-91) inherited his family’s interest in physics. He served in the Army Signal Corps during World War II and received a Ph.D. from Rutgers University in 1952. In 1956 he became a professor of physics at Colorado College in Colorado Springs, where the ANA’s headquarters and museum are located. During his tenure at the school, Dr. Wright received several grants and fellowships from the National Science Foundation. 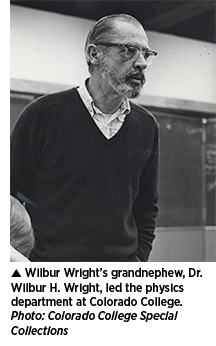 He served as chair of the physics department until his retirement in 1984 and was active in the community. 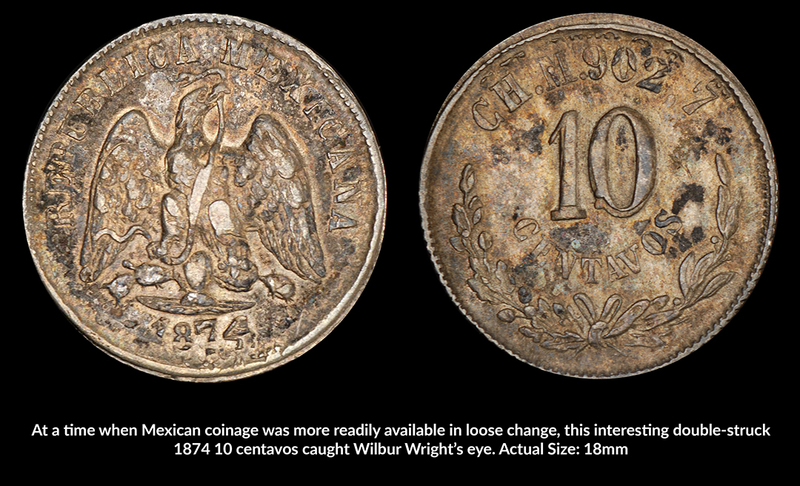 The collection consists of 101 coins from the late 18th to early 20th centuries, though about 30 apparently were added following Wilbur Wright’s death, as some specimens are dated after 1912. 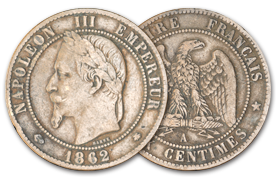 Eighteen are American issues, with other coins produced by Austria, Belgium, Canada, France, Germany, Great Britain, Guernsey, Italy, Mexico and the Netherlands. 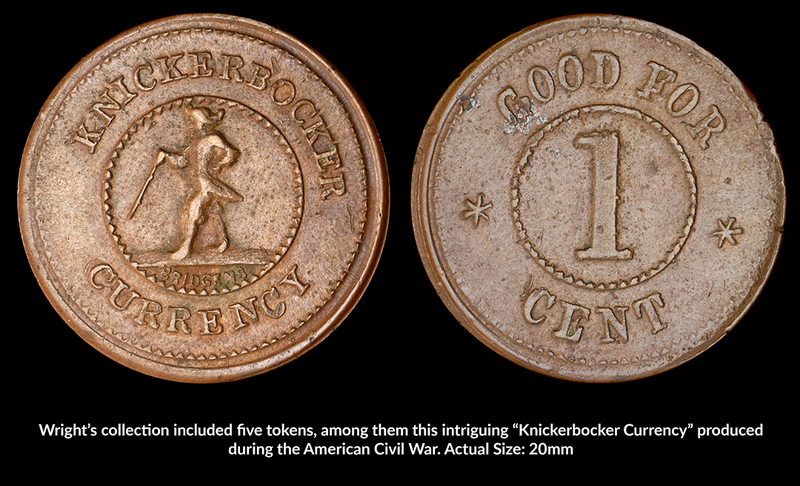 While it is not known why or when he started his collection, it is clear he had a wide range of interests and a knack for finding fascinating coins in good condition. Suggested Reading: McCollugh, David. The Wright Brothers. New York: Simon & Schuster, 2015. Interesting, informative. Taught me something new. Great blog! Really enjoyed an interesting history lesson! Oh my gosh! That's amazing!!! 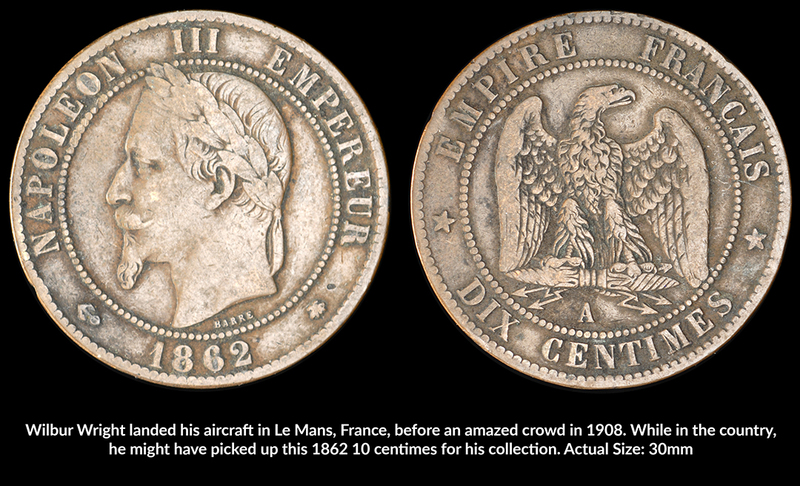 And to think that I share a hobby with one of the greatest figures in aviation history -- and that we BOTH collected a 10 centimes coin from 1862!! I need to double-check, but I believe mine was also minted in Paris! :D What a great post, thanks for sharing all this! 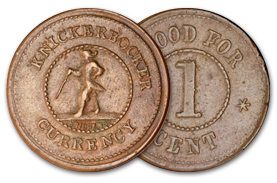 Very Interesting - Never knew that Wilbur had a coin collection - Great Story - Great Blog - Thank you for the cool information !! Having trouble with my comments. This is the second blog that t he comments listed twice. Sorry.